There is just something so appealing about a smile with perfectly straight teeth. However, the thought of going through the orthodontic treatment necessary to achieve such a smile may not be as appealing. Well, here’s another thought—you don’t have to wear a mouthful of metal braces to have straight teeth. With Invisalign from Chaska Dental Center, hardly anyone will know that you’re wearing braces until you’ve completed treatment and your smile says it all! At Chaska Dental Center, Dr. Swingdorf is an Invisalign Preferred Provider, so you can be certain that the outcome of your orthodontic treatment will be a beautifully straight smile. Dr. Swingdorf works closely with the Invisalign lab to develop a treatment plan that will gradually but effectively move your teeth into proper alignment. As the name suggests, Invisalign is practically invisible. The system uses a sequential series of clear plastic aligners to move your teeth. Your path to a straight smile begins with a thorough assessment of your oral health. Any extenuating problems—cavities or gum disease, for example—will need to be taken care of before orthodontic treatment begins. Then, we’ll assemble a comprehensive collection of x-rays, photographs, and impressions of your teeth. 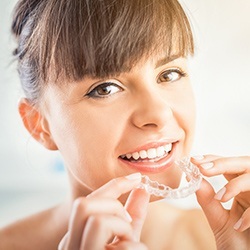 Your cosmetic dentist Dr. Swingdorf will use these to develop a treatment plan that will be the blueprint Invisalign needs to fabricate your customized aligners. The aligners arrive at our office in sets—one for the teeth along your upper arch and one for the teeth along your lower arch. In order to complete your orthodontic treatment in a timely manner, the aligners will need to be worn every day for about 21 hours. Each set will be worn for 7 to 14 consecutive days, and then you’ll advance to the next set in the series. Of course, Dr. Swingdorf will want to see you periodically to check your progress, but otherwise, that’s all there is to wearing Invisalign. Stay on schedule and a beautifully straight smile will be yours in a year or two! Aside from being practically invisible, Invisalign comes with several other advantages over traditional braces. Most importantly, they are removable. When you want to have breakfast, lunch, or dinner, just remove the aligners and eat whatever you like—there are no restrictions! Also, maintaining your regular at-home oral hygiene routine is much easier, too. With the Invisalign clear plastic braces removed, you can brush your teeth twice a day and floss once a day as you normally would. You’ll also need to keep your aligners clean, too, which is easy to accomplish with brushing and a quick rinse with warm water. Invisalign clear plastic braces are appropriate for teenagers as well as adults. For more information about Invisalign, contact Chaska Dental Center.